In the fragmented coatings industry, Assovernici’s „Colore Sicuro” project has been created to promote the excellent member manufacturers, who share and support mutual values inspired by respect for their customers, for their products, society and the environment. Coatings are products that can be found everywhere, yet consumers have little knowledge of their characteristics, quality, properties and performance. Assovernici believes that users are entitled to obtain clear and objective information about the products they buy. In promoting this aim, members of Assovernici decided to share a mutual path, inspired but the association’s Code of Ethics. They created a comprehensive classification of the characteristics of coatings in full compliance with national and international regulations governing the industry, assuring consumers that the products supplied by its members offer specific and reliable performance. 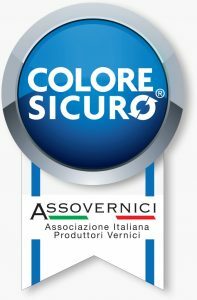 Hence, today, the “Colore Sicuro” project has been created for consumers who, when choosing a coating, can rely on its quality that is represented by the “Colore Sicuro” symbol”. The fundamental principle of the “Colore Sicuro” project is represented by the “Charter of Values” which describes the commitments undertaken by the member companies. HEALTH AND SAFETY – Acting responsibly to protect the health and safety of workers at production sites, of users and their customers. ENVIRONMENT – Favouring the cleanest technologies and eco-sustainable products with a special focus on energy saving. TRANSPARENCY – Easy access to all information on the member companies, their products and services. SOCIETY – Contributing to technological progress by operating as players involved in a social, economic and cultural context. INFORMATION – Spreading knowledge of products by helping consumers to choose the most suitable products for their needs, using clear and authentic communication. FOR PRIVATE INDIVIDUALS who, independently or with the assistance of a professional, can finally live in the home that they have always wanted: a healthy, comfortable and attractive one. FOR PAINTERS AND DECORATORS who will be able to offer the right solution for any type of requirement and any special demand, with reliable results and customer satisfaction, thus seeing their professionalism valued. FOR DESIGNERS who will be able to choose the best products to use, with no limits to their technical or aesthetic creativity. FOR DISTRIBUTORS who, having new and more effective selling points, will be able to flawlessly solve any and anyone’s type of problem, standing apart from any competition, building customer loyalty and offering new incentives for turnover. Arsonsisi has joined Assovernici’s „Colore Sicuro” project with its complete range of industrial coatings.